In addition to our all-state honors, which will be released next week along with stat leaders from the season. We have released our 2018 Boys All-Tournament Team (Girls also up on our website main page). To be eligible for the five member list per class (six in 1A-II due to tie), you had to play in at least two games at the 2018 state tournament this season. We also noted impressive performances in opening round loss. PARENTS/ATHLETE/COACH: To order your All-Tournament Team Patch from Sports in Kansas email Chet Kuplen at sportsinkansas@gmail.com. You can also wait to order these with the all-state and stat leader patches on Sunday 3/18. He had a team high 21 points in the opening round win over Lawrence, another 21 for a team high in the semifinal win over Derby and followed that up with a team high 19 points in the title game. He helped the Huskies repeat in 6A for the second time in program history, both repeats under head coach Ed Fritz. This tournament was loaded with talent and brothers, Parker and Christian Braun of BV Northwest, could have easily gotten nods on the all-tourney team if we expanded it to a few more players. 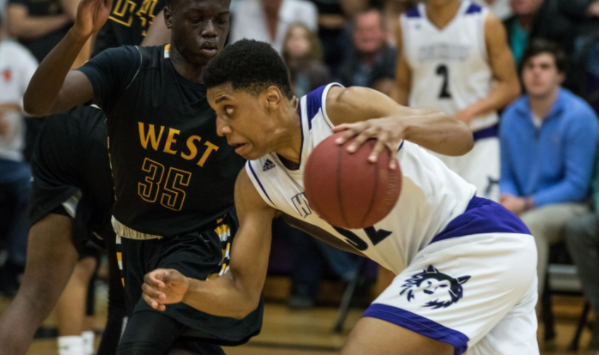 BVNW was loaded but it was Pleasant who was the most consistent along with Ward at the state tournament in 2018. Bryant Mocaby, a senior from Derby that played at Goddard last year, didn’t have the team outcome that he wanted but had an outstanding tournament as an individual with 76 total points over three tournament games. Impressive performance in round one but lost: Marcus Davis of Olathe North had 24 points in the opening round loss to Derby (84-81) along with 18 points from teammate Tymer Jackson. Mason Myers also had 16 points for the Eagles. Evans had a team high 14 points, four assists, and two steals in the first ever state basketball title win for the Golden Eagles. It was a low scoring affair in the title game with Carroll winning 43-41, despite only scoring five fourth quarter points. He also had 10 points in the opening round game and a team high 14 points and eight assists in the semifinal win. Kaifes had 82 points over the 2018 state tourney as the Jaguars who had near a losing record entering sub-state finished fourth in the state of Kansas. He went for 28 in the fourth-place game on Saturday and 32 in the opening round upset win over Eisenhower. He had 20 points in the semifinal loss against Carroll. Had his team got into the title game, it would have been hard to keep the Loyola-Chicago signee out as MOP. Impressive performance in round one but lost: Tyon Grant Foster had 19 points in the opening round loss to eventual state champion Bishop Carroll and is one of the top 5A players in Kansas over the last two seasons. Instantly you may have thought Robinson-Earl (Miege) or Pyle (McPherson) would be the pick headed into the tournament but the differentceof Miege getting the state title this week was the play of Spencer Jones in the title game. Jones had a championship game-high 23 points as he went four of seven from three. He scored in double figure points in all three tournament games. This was a loaded all-tournament team that could have even had Jake Alexander (McPherson), Braden Belt (Andover Central), and Xavier Bell (Andover Central) make the list. Pyle had 65 points in the three tournament games and with a win would’ve been the likely MOP. He finished his career as the all-time leader in points scored and rebounds for the McPherson High School boys program. Impressive performance in round one but lost: Tanner Russell and Javon Reliford combined for 35 points in the loss to Bishop Miege in the round one loss for Labette County. Tamar Bates had 18 points in the loss to Andover Central in the quarterfinal loss for Piper. Harvey exploded for 78 points in the state tournament including 27 in the opener and 34 in the state championship game. The four-star junior recruit is one of the top juniors in the country. DeShawn Haninka was huge in the semifinal with 25 points for Hayden and also had double figures in the title game. Harvey had 27, 17, and 34 in the three tournament games for the Hayden Wildcats on the way to the 2018 state title. Impressive performance in round one but lost: Marysville was a state contender its just unfortunate they ended up meeting with Hayden round one because of record and seeding. They also featured one of the states best players in Gabe Pieschl who had 21 in the 57-51 loss in round one of the 4A-II tournament. Marysville was last years 3A state champ as Pieschl was last years 3A Player of the Year. O’Neal had a game high 15 points in the 3A state title game for the Dragons to help bring home their first state title since 2001. He was also the leading scorer over the 3A state tournament. Also a big shout out to Braden Gerber’s take to win the state title 44-42 as time expired. Andrew O’Brien was third in the tourney in scoring at 13.7 points per game. Baylor Bohling also came off the bench to score 22 in the semifinal and 10 in the opening round game to average 12 over the tourney. Dalton Kraus also averaged 10.3 points per game over the 3A tournament. It was a total team effort the for Halstead finish. This was one of the most balanced tournaments as far as talent. There wasn’t a star that absolutely stood out it was more about teams but the leading scorer over the three tournament games was Kason O’Neal of Halstead who scored 44 points over there tournament games for a 14.7 average. Impressive performance in round one but lost: Carter Brown had 21 points in the opening round loss to Halstead by two who would go on to win the 3A state tournament. Caney Valley was one of the most complete teams in 3A and went home early in a thrilling 3A quarterfinal. Just like his younger sister who earned 2A MOP, Ryan takes home honors for his 11-point, five assists, and three steal performance that helped direct Central Plains to their first ever state title in undefeated fashion. He also lit it up in the round one win over Inman with a game high 25 points. He is the piece that makes this CP team go. Outstanding tournament for the junior. Brett Liebl had 47 points over three tournament games for the Oilers in their first ever title as a school. Liebel, Ryan, Alex Hickel, Myles Menges, and Alex Barton were one of the most balanced lineups in the state this year. Impressive performance in round one but lost: Jared Casey, sophomore of Plainville, was one of the better 2A players in the state this year and has two years left. He had a double-double with 19 points and 12 rebounds against Colgan in the opening round loss. Gilbert Peters, South Gray Sr.
Peters helped South Gray to an undefeated 26-0 record and was one of the most dominating players in the state this season. He had 23 in the title game, 16 in the semi and 20 in opening round play to lead all scorers at the 1A-I tourney. Peters also led all scorers in the tourney but not far behind was teammate Clifton Miller who scored 58 to Peters 59 points over the 2018 1A-I tournament. Impressive performance in round one but lost: Nick Withington of Atwood-Rawlins County had 25 points in the opening round loss to eventual runner-up Hanover. He has scored over 1,000 career points for the Buffaloes. Riley Sides, Northern Valley Jr.
Riley Sides scored 63 points over three tournament games to give Northern Valley its first state title since 1991. Sides had 24 in the title game over Elryria Christian. In addition to Caden Bach having an an all-tourney weekend, Ross Cole, Caden Kinderknecht and Nicholas Stutsman also had big tournaments. Sides scored 63 points but not far behind was Trevor Medina of fourth place Wallace County who had 62 over three tournament games. Impressive performance in round one but lost: Quinn Buessing of Axtell had 26 in the opening round loss to eventual runner-up Elyria Christian.